Harare - The mickey mouse behaviour and blame game between ruling Zanu-PF party and main opposition MDC party continues within the august house, with no solution at hand. The ensuing slanging match saw other lawmakers joining the fray thereby disrupting question time session. Since their inauguration, the MPs have engaged in heckling and trading of accusations and counter-accusations, with the opposition refusing to recognise President Emmerson Mnangagwa as the country's leader, citing election irregularities. In the meantime, Justice, Legal and Parliamentary Affairs Minister Ziyambi Ziyambi accused MDC Alliance House of Assembly representatives of hypocrisy for demanding to have Cabinet ministers attend Parliament to respond to their questions when they did not want to recognise the appointing authority. Ziyambi said the time had come for ministers to start declining to respond to questions from opposition backbenchers until they recognised President Mnangagwa who won the July 30 harmonized elections. 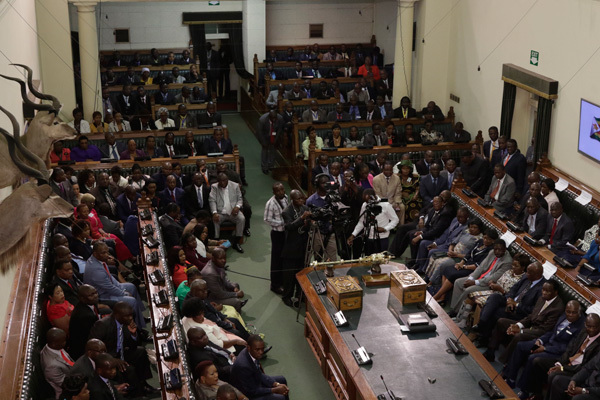 His remarks followed an incident recently in which MDC Alliance lawmakers refused to stand up as the Head of State and Government walked into the august House to follow the 2019 National Budget Statement that was presented by Finance Minister Professor Mthuli Ncube. The MDC Alliance lawmakers also declined to accompany Speaker of the National Assembly Advocate Jacob Mudenda and Senate President Mabel Chinomona to State House where the presiding officers were officially introducing themselves to President Mnangagwa following their election. Only leader of opposition in the Senate, Engineer Elias Mudzuri accompanied presiding officers but was at the receiving end of a backlash from his colleagues who openly dressed him down at a local hotel. “Ministers, according to the Constitution, are appointed by the President and serve at the pleasure of the President. The Honourable Members do not recognise the President. We cannot continue in this House with hypocrites. “You cannot on one hand refuse to recognise the President but on the other want to ask questions to the same ministers appointed by the President,” said Ziyambi. Responding to another question, Higher and Tertiary Education Minister Professor Amos Murwira said they had stopped funding Advanced Level students studying Science Technology, Engineering and Mathematics saying his ministry’s mandate was to take care of tertiary students. He said “A” Level students were handled by a different ministry and using STEM funds for high school pupils was improper. Kwekwe Central MP Masango Matambanadzo (National Patriotic Front) had asked why Government had stopped funding “A” Level students. “We will continue providing scholarships under STEM. The idea of helping ‘A’ Level students was not proper. We stopped it. Money was being abused,” said Prof Murwira. He said a forensic audit conducted on STEM unearthed rampant abuse of the fund which eventually saw them reverting to its mandate whic excludes support to “A” Level pupils. Energy and Power Deputy Minister Magna Mudyiwa said Government was making frantic efforts to ensure that enough fuel was available during the festive season. “Fuel is now getting to several stations and we will continue to ensure that the situation returns to normal,” she told legislators during a tension-filled sitting.